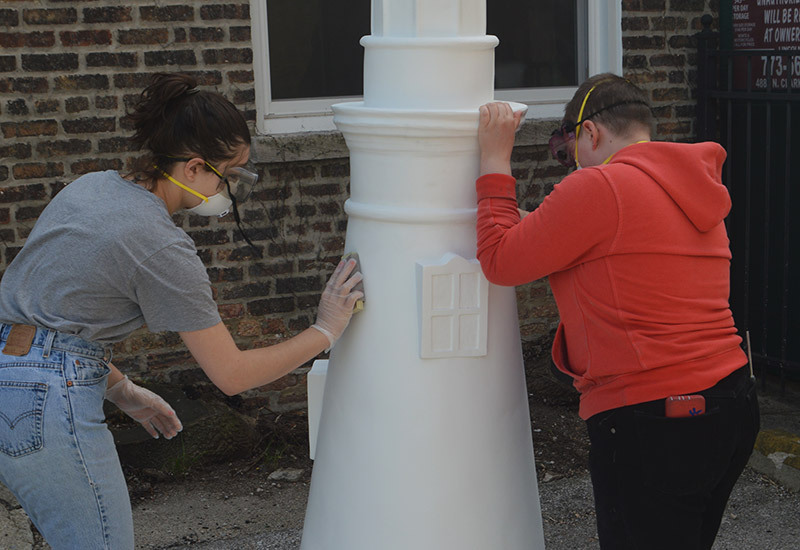 Created by residents in May of 2018, our lighthouse will be on display at 430 North Michigan Avenue from June 19 – August 11. Come check it out, snap a pic with it, and post it on our facebook page! 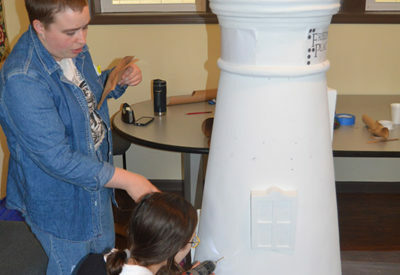 Creating our Lighthouse involved taking a 40+ foot piece of fabric that had been woven collaboratively on a community loom by weavers who are blind and disabled, and wrapping it around the structure. The various sections of the weaving are made of different types of threads and yarn, some very fine and smooth and others thick and rough. 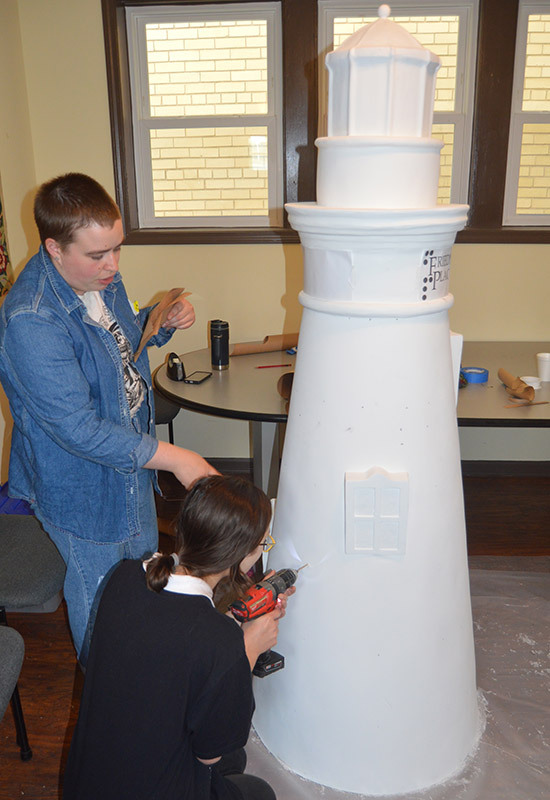 It provides a ranging and varied textural experience to the person viewing and touching the completed lighthouse. The colors vary by section, with some being muted and others quite bright. This piece has been selected in part because it shows weavers of various skill levels responding to pattern, texture and color and jointly creating an ultimate expression of their collaborative work. 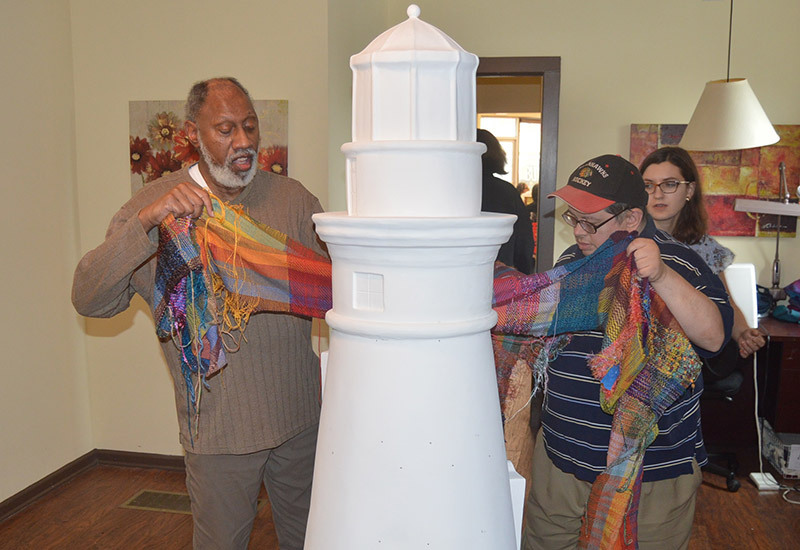 The final “woven lighthouse” is a beautiful and visually arresting experiential beacon for access and inclusion for people with disabilities. 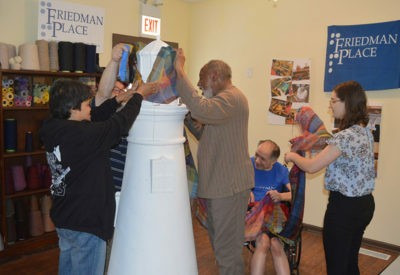 Friedman Place’s weavers represent a unique point of view. 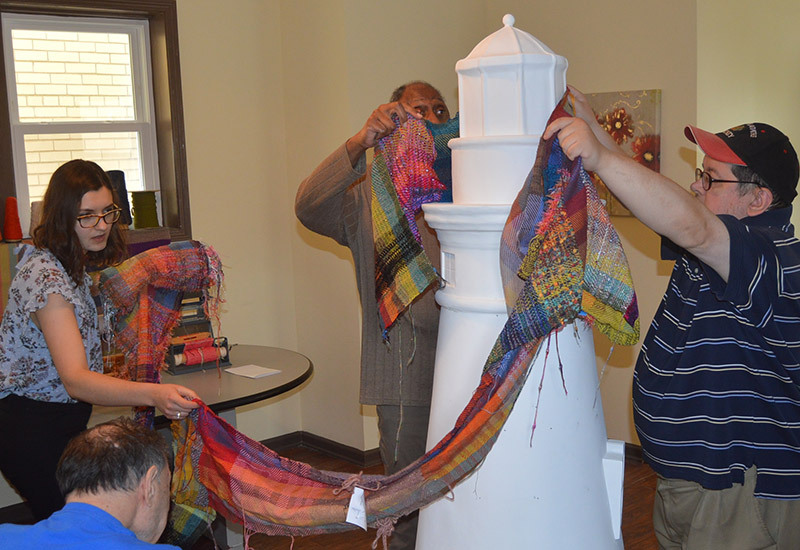 Our Therapeutic Weaving Program functions as a creative outlet for individuals who are living with a disability or multiple disabilities, with blindness being the common factor. Our weavers are always eager to present their work and share with others what they can accomplish when the all-too-common barriers to inclusion are lowered. 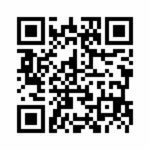 The opportunity to have their collaboratively created artwork displayed to so many thousands of people through a public display of this type is extremely empowering, compelling and validating. The agency’s Therapeutic Weaving Programs is part of the David Herman Learning Center, which honors the legacy of lifelong learner David Herman, a 25-year Agency resident who was blind and deaf since early childhood. 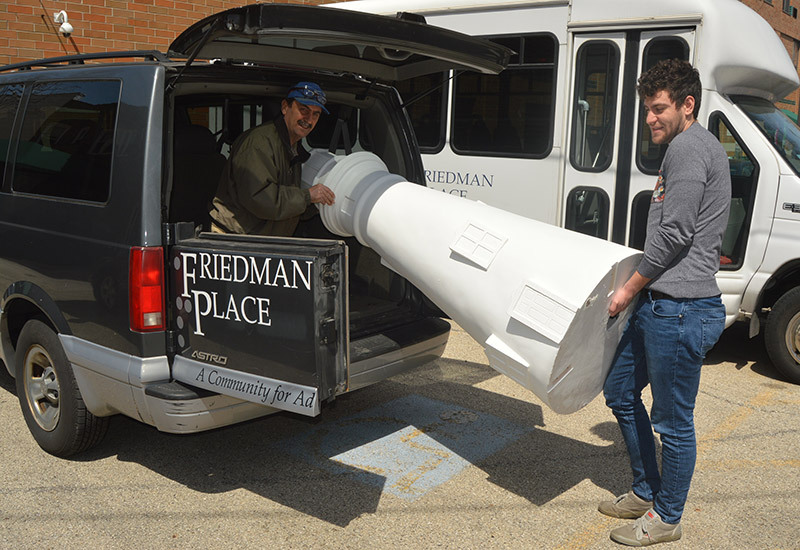 Friedman Place residents are empowered through the center to pursue learning opportunities and technology skills to their greatest desire and capacity. The Therapeutic Weaving Program – located at Friedman Place – provides residents an opportunity to create original, one-of-a-kind weavings and in the process enhance the individual’s sense of self-efficacy and worth as well general learning and socialization, as most weaving is done individually but in a group setting. 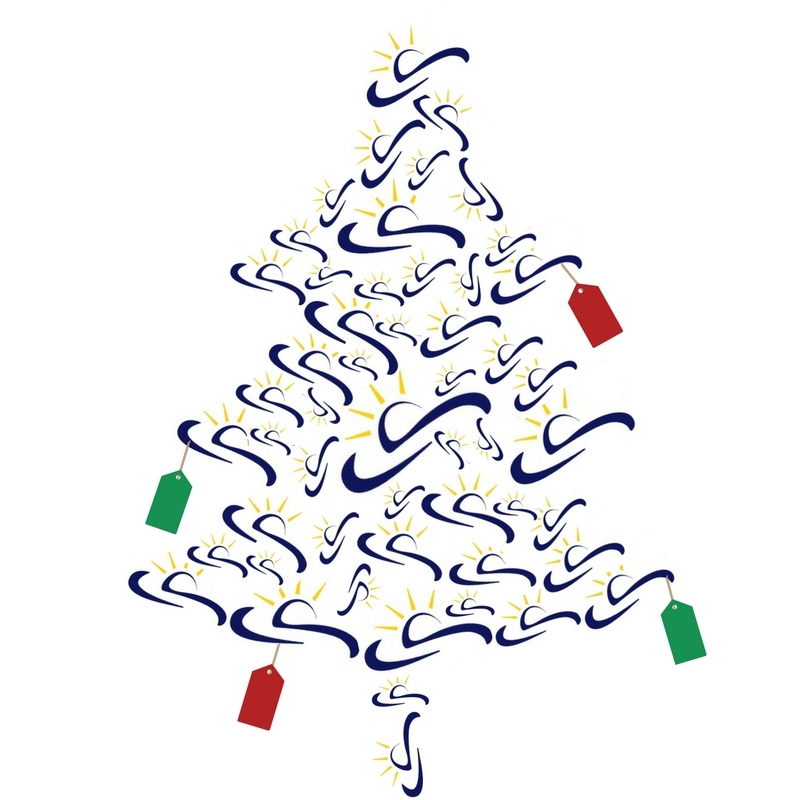 All aspects of the program are educational and facilitate learning to the resident’s greatest desire and capacity.